When we carry our baby, we often rock back and forth. It relaxes them and they often fall a sleep in no time. But why? And does this rocking have any other benefits besides ‘sleepydust’? Apparently it does. One of the less well known benefits of babywearing is the fact that it stimulates balance and motor development! This is done by the moving and rocking motion. How does this work? Babywearing stimulates the vestibular system and as such the development that is related to this system! Let’s take a look at the vestibular system. The vestibular system is a tiny system that controls a baby’s sense of balance. All information with regard to movement is processed by the vestibular system. It helps us to understand where our head and body are in space. This information is processed by the brain, combined with information from the eyes, ears and inner muscles. Our eyes tell us where we are in the room, our ears tell us what is going on in the room, the vestibular system recognizes if the body is standing still or moving. It focusses on various levels of motion: side to side, up and down, back and forth, circular, etc. All functioning together to keep the body in balance. 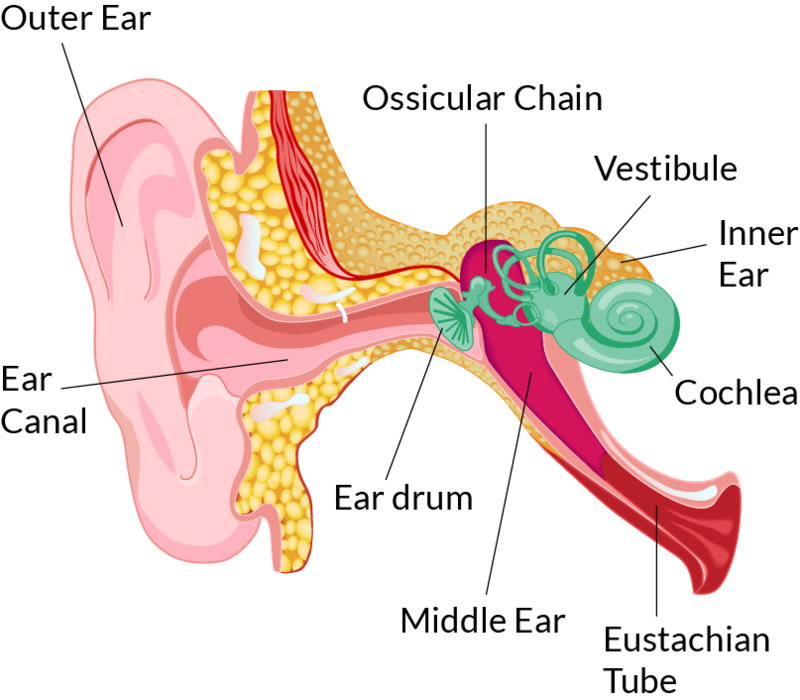 The system is located behind the ear and consists of the vestibular organ, the middle ear and the inner ear. That’s why earproblems can sometimes lead to difficulty keeping your balance. Around the 6th to 10th week of pregnancy, the vestibular system is one of the first brain structures to develop. A fetus can detect movement. Eight months into the pregnancy, the system is so developed that it can set off a baby’s first reflexes! The Moro reflex, startling the baby, can be activated when a mother changes from sitting to standing. The Moro reflex is also seen in newborns until they are about 3 months old. 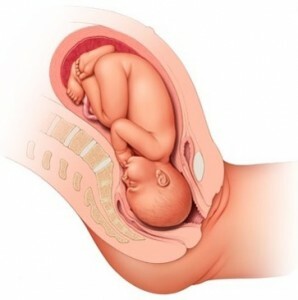 Even the fetus’s ability to position itself downward when it’s time for labor is a result of a well-developed vestibular system. Coordinate eye and head movements (following a ball through the air). Helps to develop and maintain normal muscle tone (to be able to hold the body in one position). Impacts a child’s balance (otherwise we would be clumpsy and fall often). Coordinate both sides of their body together (for riding a bike or using a pair of scissors). Babywearing stimulates the vestibular system and as such the development that is related to this system. It stimulates the system much more than when babies are lying down. In the womb, the baby’s very sensitive vestibular system is constantly stimulated because a fetus experiences almost continuous motion. You could say the baby ‘expects’ this feeling. They miss it when lying in their crib. Sleepy dust is a wonderful babywearing benefit! Babywearing allows a little one to execise their neck much more than when they lie in a crib, play pen or stroller. When lifting the head, the baby is not only training the neck and back muscles, but also the interaction between the vestibular system, the eyes, the nerve system and various muscle groups ! In the book: ‘The Attachment Parenting Book” Bill and Martha Sears note that babywearing stimulates the infant’s vestibular system: “the stimulation helps babies breathe and grow better, and improves motor development” . But what about strollers? The baby is also moving. Yes, true, but this is either a forward or backward motion, and not varied like in babywearing. The vestibular may be less commonly mentioned than other sense, like sight, sound, smell, taste and touch, but it significantly impacts everyday activities. Activities such as rocking and carrying, and as such babywearing, stimulate a baby’s vestibular system. It stimulates the system much more than when babies are lying down.Don’t worry about not giving your baby enough room to learn how to crawl or walk. Babywearing has a positive effect! A Secure Base (2011) The Science of Babywearing. Regeling, M. (2015) Sensorische informatieverwerking; het vestibulaire systeem. Sears & Sears (2001) The Attachment Parenting Book: A Commonsense Guide to Understanding and Nurturing Your Baby. Eliot, L. (1999) What’s going on in there? How the brain and mind develop in the first five years of life. Jenson, J. (2002) Bringing up good babies: an ethnography of moral apprenticeship in Saraguro.